Survivor: Heroes vs. Healers vs. Hustlers merged the three tribes and then voted out Jessica Johnston during Wednesday night's episode on CBS. "I think I experienced the biggest blindside of my life. My heart is broken," Jessica said following her ouster. "Who knew a game could crush you? I thought only guys could do that. I was wrong. But I will miss [Cole Medders]. I hope he makes it far and we can still have a date when Survivor is over." 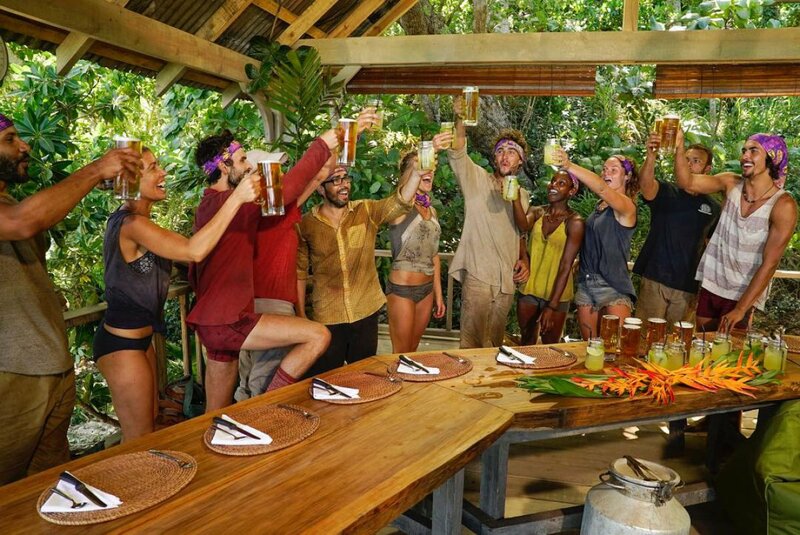 The Survivor broadcast began with three tribes mixed of Healers, Hustlers and Heroes thanks to a previous tribal swap. The Soko tribe was comprised of original Hustler Ryan Ulrich, a 23-year-old bellhop from North Arlington, NJ, as well as (Heroes) Chrissy and JP Hilsabeck, a 28-year-old firefighter from Los Angeles, CA. The Yawa tribe was comprised of (Healers) Jessica; Mike "Dr. Mike" Zahalsky, a 43-year-old urologist from Parkland, FL; and Cole, a 24-year-old wilderness therapy guide from Little Rock, AR; as well as (Hustler) Lauren Rimmer, a 35-year-old fisherman from Beaufort, NC, and (Hero) Ben Driebergen, a 34-year-old U.S. Marine from Boise, ID. "Levu" was comprised of (Healers) Joe Mena, a 34-year-old probation officer from Bronx, NY who currently resides in Tolland, CT, and Desi Williams, a 27-year-old physical therapist from Peachtree City, GA who currently resides in Newport News, VA; (Hustler) Devon Pinto, a 23-year-old surf instructor from Carlsbad, CA who currently resides in Solana Beach, CA; and (Hero) Ashley Nolan, a 26-year-old lifeguard from Satellite Beach, FL. On Night 16 of the game at Soko's camp, Chrissy was proud of herself because she said she was playing the game 24 hours a day. Chrissy believed she was dominating the social game, which was apparent in the way both guys in her tribe were closer with her than they were with each other. She felt she was in a power position with the merge right around the corner. The following Day, at Yawa, Cole felt good with the five members in his tribe, especially having Mike and Jessica with him. Cole assumed the other tribes wouldn't be as united or strong as his own. Cole acknowledged to the cameras they hoped to bring in Joe and Desi with them come the merge to have the numbers. However, Ben was concerned about Cole because he was "playing Patty Cake" all day long with Jessica and it was hard to trust that connection. At Levu's camp, Ashley noted her tribe was in real trouble because they were two against two -- Devon and herself vs. Joe and Desi. Also, no one was in good shape physically, as they had completely run out of food, including rice. Devon admitted his brain felt "dead" and each of his limbs weighed about "a thousand pounds." The tribe needed a Reward victory, and fast. The three tribes then gathered together to meet Survivor host Jeff Probst, who wasted no time by telling the castaways to drop their buffs for the merge. There were five Healers, four Heroes and three Hustlers left in the game. After getting settled at the tribe's new camp, they feasted on a huge Outback Steakhouse meal. Chrissy was so glad she spent the game so far without Joe, because she found him "loud and obnoxious." Joe revealed to her that he had previously played a hidden Immunity Idol, and that made her fear that he had found another one at Levu, which was actually the case. Meanwhile, Jessica's plan was to work with Lauren, Mike, Cole, Ben, and hopefully Joe and Desi. But no one realized how tight Ben and Chrissy were from their first days in the game as members of the original Heroes tribe. Chrissy expressed her concern to Ben about Joe having an idol, and the pair planned to continue keeping their alliance a secret. As the tribe was building their new shelter on Day 17 with hammers, machetes and nails, Cole went off looking for a hidden Immunity Idol himself. Desi teamed up with Jessica and told her they should only keep Joe around for as long as it was beneficial. Jessica was also certain she had Lauren and Ben with her, so she was "feeling like a queen bee." As a Hustler, Ryan was looking to make an alliance right away after eating the steak, potato, chocolate cake and beer feast. Ryan and Devon quickly reunited, and they determined they must work with Heroes Chrissy, JP and Ashley going forward to take out the dominant Healers. Ryan thought they had Lauren too, so it was becoming increasingly more clear Ben and Lauren were in the middle of the two sides. On Day 18, Devon noted that the strongest people made it to the merge, and since the Heroes and Healers viewed each other as threats, he felt the Hustlers could fly under the radar and were in a good, swing position. Prior to the first Individual Immunity Challenge of the season, Lauren noted she wanted to stick with the Healers and her former Yawa tribe, especially Mike. Lauren therefore warned Mike that Devon wanted to take out all the former Healers. But Mike felt his tribe was five strong, plus Lauren and Ben, so he didn't really seem worried. He just hoped the rest of the tribe wouldn't gang up on the Healers. Devon suggested taking out Cole or Joe next when speaking with Chrissy and Ben, explaining that Joe was strategic and really knew how to play the game, while Cole was a huge physical threat for upcoming challenges. Ben had a big decision to make -- go with the old Healers and Hustlers, or stick with his former Yawa tribe. But Ben still questioned if he could trust Cole, whom he called "selfish" and disrespectful. Jessica told the cameras that Cole didn't think before he acted, mainly when it came to eating a lot of food at camp. Since Cole was her "No. 1" ally, she decided to stick with him and help him out. Jessica therefore advised Cole to eat less food and be more considerate of others because people were getting annoyed with him, specifically Ben. Ben told Mike that Devon wanted Cole or Joe out, and that he would be onboard with that since Cole was the biggest threat. Mike quickly realized that Ben was wavering in his decision of whom to vote for, and that really worried him. Mike attempted to convince Ben that he had Cole in his pocket and this wasn't the right time to get rid of him, explaining that eliminating Cole would ruin everything they had worked for in the last nine days of the game. Mike then warned Cole that he was on the chopping block, as well as Joe. Cole became paranoid about being the target, but he hoped the Healers would have his back. On Day 19, Solewa met Jeff again for the first Individual Immunity Challenge of the season. Each castaway was required to stand on a narrow beam while spinning a ball inside a circular wooden trap. At regular intervals, the players had to move farther down the beam, making it more difficult to balance and keep the ball rolling. If the ball dropped at any time or a person fell off the balance beam, he or she would be out of the competition. Seconds into the challenge, Ryan dropped. He was then followed by Mike, Jessica, Ben, JP, Devon, Lauren, Joe, and Cole. After 38 minutes, Ashley and Desi remained. And in the end, Desi won Individual Immunity. After the challenge, Cole apologized to Ben for rubbing him the wrong way as a way to save himself from the chopping block. Ben admitted it bothered him when Cole ate food all the time or would catch a fish and not share it with anyone else. Cole acknowledged his mistakes and wish Ben had confronted him about the issue earlier. Ben seemed to appreciate Cole's apology although it didn't really fix things between them. However, Ben at least began to wonder if getting rid of Cole now was the smart move to make. Ben said he had to make a choice "tactfully" and "not emotionally." The episode then showed Cole talking to Joe about having Jessica, Ben, Lauren and Mike with them. Although Cole suggested they had made a pact to remain loyal to one another, Joe insisted to Cole that Ben was going to flip, and he turned out to be correct. Meanwhile, Joe was ready to play his idol just in case. Before Tribal Council, Mike thought the Healers, plus Lauren, were going to vote out Chrissy since she was such a smart, strategic player. He questioned Ben's loyalty, however, due to their previous conversation about targeting Cole. Ben and Lauren were in the middle and had to choose a side, but Mike, Cole, and Desi obviously hoped they'd have the numbers. Meanwhile, Chrissy talked to her allies about sending home either Joe or Cole. But because the alliance worried one of those guys might have an idol, they decided to prepare a "Plan B" by putting their votes on Jessica instead, which would still serve them well in the long run because she was a good player and part of a power couple with Cole. Chrissy bragged to the cameras about being a student of the game for 16 years; she just hoped she was going to be on the right side of the vote. At Tribal Council, Joe announced that he had only heard three names being tossed around so it was ridiculous and silly for 12 people to be nervous and paranoid. Chrissy told Jeff that people were looking at a lot more than physical threats at this point in the game although physical players are typically the first ones to go after the merge. Joe then insisted to everyone that he's a loyal guy and someone great to keep around, adding that there were bigger threats in the game. Joe then revealed to everyone that he had a hidden Immunity Idol and could play it if he wanted to. At the sight of Joe's idol, Cole feared he'd be going home. Before the votes were read, Joe decided to play his idol for himself. Jeff then read the votes aloud in the following order: Chrissy, Jessica, Chrissy, Jessica, Chrissy, Jessica, Chrissy, Jessica, Chrissy, Jessica, Jessica, and Jessica. The episode's closing credits later showed that Jessica, Mike, Desi, Cole and Joe voted to oust Chrissy from Survivor's 35th season. But the majority -- Ashley, Chrissy, Devon, Ryan, JP, Lauren and Ben -- voted for Jessica.